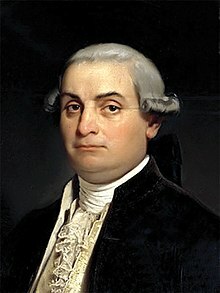 Cesare Bonesana di Beccaria, Marquis of Gualdrasco and Villareggio (Italian: [ˈtʃeːzare bekkaˈriːa; ˈtʃɛː-]; 15 March 1738 – 28 November 1794) was an Italian criminologist, jurist, philosopher, and politician, who is widely considered as the most talented jurist and one of the greatest thinkers of the Age of Enlightenment. 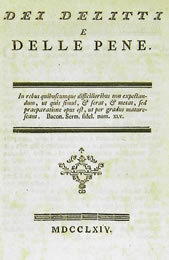 He is well remembered for his treatise On Crimes and Punishments (1764), which condemned torture and the death penalty, and was a founding work in the field of penology and the Classical School of criminology. 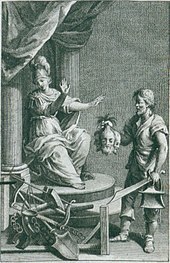 Beccaria is considered the father of modern criminal law and the father of criminal justice. Bridgewater, Thomas Rawling (1913). "CAESAR BONESANA, MARQUIS DI BECCARIA". In Macdonell, John; Manson, Edward William Donoghue (eds.). Great Jurists of the World. London: John Murray. pp. 505–516. Retrieved 13 February 2019 – via Internet Archive. This page was last edited on 28 March 2019, at 21:17 (UTC).